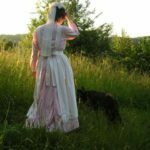 Here are details of the shirtwaist of my 1900s gingham wash dress. 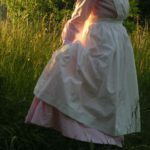 The shirtwaist is without a lining and unboned, rather like a modern blouse. ‘There must be no undue stiffness, no tailor’s canvas and linings, which are impossible to launder’ (source). Here are 1911 instruction on how to make such a gingham shirtwaist. The pattern I’ve made is based on these 1911 and 1916 shirtwaist patterns. The shirtwaist is closed in front with five buttons. 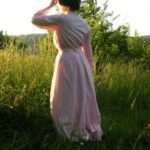 The waist has a stand-up collar, as this and this Edwardian cotton dress. 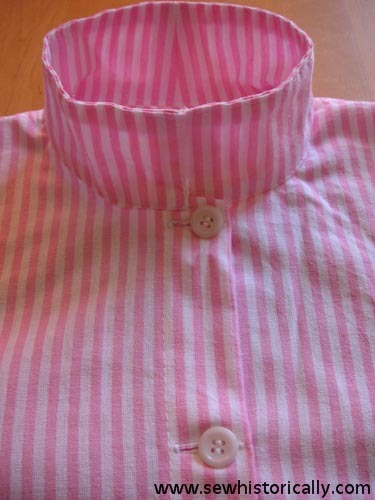 The collar consists of two layers of fabric, and is made from four pieces, so that the stripes are straight in front. 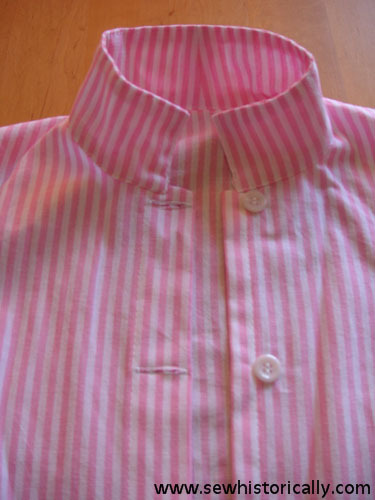 The pattern is similar to this 1905 collar pattern. 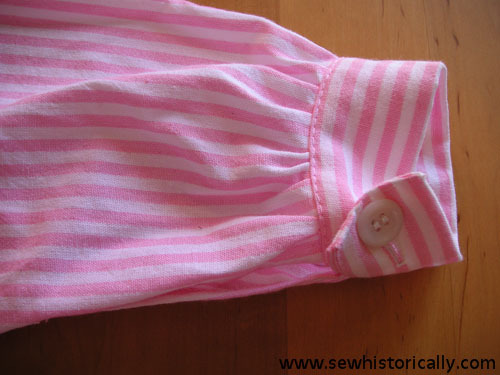 The sleeves are gathered into a cuff (as in this and this 1905 dress) and closed with a button. 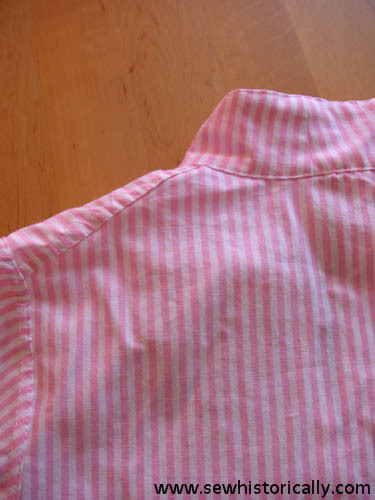 The shoulder seam is joined with a ‘felled seam, finished on the right’, which is recommended for this 1916 gingham house dress. 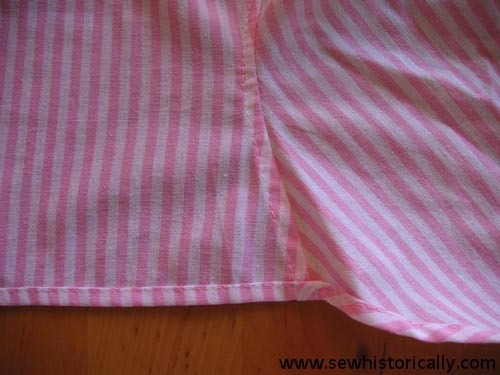 The instructions continue that the ‘under-arm seams and the sleeves may be joined with french seams’; but I’ve joined all the seams with felled seams, as I find french seams make rather a stiff seam and felled seams are easier to iron. And this 1916 source states that felled seams are ‘used any place where a flat seam is desired’. 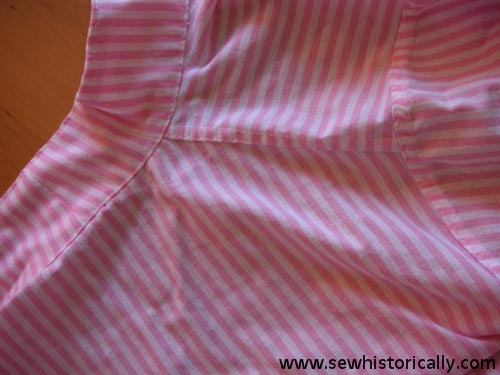 The bottom of the shirtwaist is finished with a narrow hem. 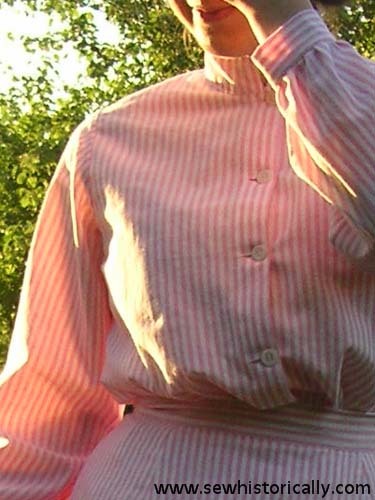 This shirtwaist can also be worn as tied blouse.